It’s pathetic, but for some mysterious reasons, factory speakers don’t always meet your desire. And even if you somehow manage to ensure the quality, they don’t last longer. But, hey, if your built-in car speaker isn’t that energetic or wearing out lately, it shouldn’t stop you from putting your hands up in the air (Or on the steering wheels, I mean). You have all the rights to own better sound system, and no matter what, we’ll give that to you. So, don’t panic about the wrong purchase. We introduce you the 3 way best 6×9 speaker from RockFord Fosgate’s Prime series: the ultimate Rockford Fosgate R169X3 Prime 6 x 9 Inch 3-Way Full-Range Coaxial Speaker. One of the best 3 way 6×9 speakers on the market. Also the best car door speaker. In addition, everybody wants the best sound experience in their car, and for higher dispersion car door amp has become a thing now. However, all car speakers available on the market aren’t functioned with necessary features for that. 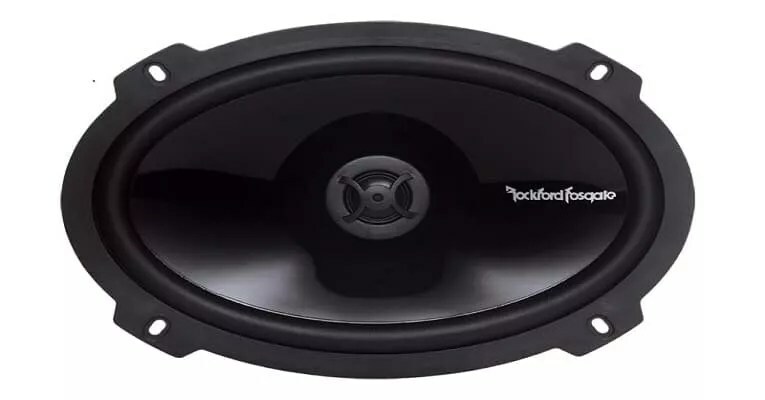 In this case, Rockford Fosgate R169X3 Prime 6 x 9 Inch 3-Way Full-Range Coaxial Speaker can come handy as a high-quality car door speaker and amazingly the price is quite low too. Enough reasons to call it the 3 way best 6×9 speaker. Rockford Fosgate Speakers is a 6×9-inch 3 way full-range coaxial speaker. Functioned with outstanding features for better frequency than average factory speakers. Features Vacuum Polypropylene cone with rubber surround to handle stronger frequency waves and prevent damages. Comes with integrated tweeter crossover that saves you the expense of additional crossover wirings, with some space as well. This crossover divides the notes into different drivers to let you enjoy full clarity. Features two tweeters (One of them is a super tweeter) for clear sound dispersion without major distortion. The package features grilles and necessary mounting hardware. It’s also one of the best car door speakers. If you think these highlights aren’t satisfying, let’s discuss the features in details and give you a thorough review of every function. So, let’s see, what do we have here? Rockford Fosgate R1 Coaxial speakers are built with a simple structure. Instead of featuring individual sections for different driver components, it merges them inside one device. So, these speakers are easy to mount, less wiring complication and don’t take much space. 6×9 speakers are actually configured to deliver a lucid mid-range sound. Moreover, these speakers are wired to separate different bass notes with explicit frequency. Clear bass notes are always number one priority when you’re looking for the best car speaker. Rockford Fosgate Car Speakers Gives you that, along with pleasant mid-range waves. And the convenient part is, no fancy set up condition is required. Rockford Fosgate Prime is a 3-way speaker. It features woofer, tweeter and an individual super tweeter. Woofer is included for lower frequency audio, where tweeter is meant for separating high-frequency notes. But in 3-way speakers, a super tweeter is added for sharper distinguishing of different frequencies. They separate more individual frequencies than a single woofer or tweeter and reduce sound distortion. In a way, it saves you from ghetto noise of some frequencies that can’t be separated with the help from woofer or tweeter alone. The speaker features 1/2″ silk dome Piezo tweeter. Silk is used to maintain the frequency discipline and produce warm indeed crisp sound. Besides, silk texture maintains internal humidity and prevents harsh noise. Crossover is an absolute necessity to divide the frequencies into separate drivers for better sound. But an extra crossover device eats up a little more space than usual, and its additional wiring makes the set up complicated. But this speaker features its own built-in crossover, which saves you the extra work of crossover adjustment. This crossover makes it the 3 way best 6×9 speaker. The cone is an essential part of a speaker since this is the reason we can hear the sound. And the sound’s quality majorly depends on its construction. This speaker’s cone is constructed of polypropylene, and the surround is made out of rubber. Rubber surround makes the system durable for any circumstance. Polypropylene protects the system from internal damping and humidity. Grilles are included to protect the system from external damping or any kind of hit. You can use this 3-way coaxial speaker is also one of the best car door speakers. It works with 130 watts power maximum, 65 watts RMS and delivers high-quality sound within 47Hz – 22kHz frequency. How many speakers are there in a package? A: Every package features a set of two speakers. Do they come with wires to plug? Do I need to buy an additional sub-woofer to increase bass? A: The bass quality is quite good. But if you still require more, you can consider buying one. Rockford Fosgate R1 is a well-regarded company in the electronic market and respected for delivering quality products. They have a number of series for differently constructed speakers, and each is the best in their own way. Following the same signature tradition, Rockford Fosgate Speaker presents you with their ‘Prime’ series and This is an honorary member of this family. It’s capable of being referred as the 3 way 6×9 speaker and the best car door speaker. Rockford Fosgate 6×9 Speakers gives you the experience of crisp sound with separate frequencies and it has made this amazing experience possible within a wonderful prize. So if you want the best music experience in reasonable expense, you’re welcome to look Rockford Fosgate R169X3 Speaker reviews and rating up on Amazon.